It’s my birthday today. I’ve been doing the usual holiday things this past week (seeing family, shopping, baking! ), working, and also reading middle grade sci-fi and fantasy rather madly in order to finish the CYBILS list. But yesterday to ‘reward’ myself for good behavior and for entering a new decade (okay, and because I need to return it! 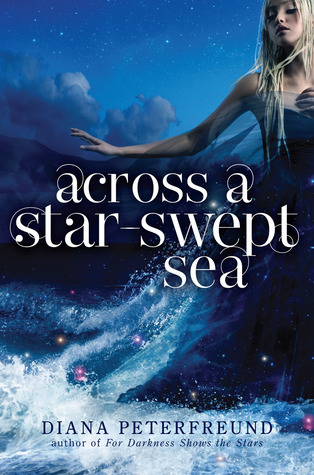 ), I finished up Diana Peterfreund's Across A Star-Swept Sea. I’ve been waiting for this book ever since I finished For Darkness Shows the Stars, and I have to say it was very, very fun. Filled to the brim with lovely frocks and spying and genetic engineering, and therefore perfect birthday reading. Persis Blake is living a complicated double life. On one side, she’s a fluttery socialite without a care in the world except to lead the fashions of Albion and advise the Princess Regent on her wardrobe. On another, she is the Wild Poppy, a daring spy who has made quite a name for himself rescuing aristocrats from neighboring Galatea, where horrible atrocities are changing the face of a civil war. Balancing both existences demand that she lie to everyone – especially to the handsome young Galatean medic Justen Helo, whose motives are unknown and who Persis must pretend to love. It’s dangerous, fashionable, and deadly serious business. Diana Peterfreund penned a winner with her first YA sci-fi, a retelling of Jane Austen’s Persuasion, set on an island in a post-apocalyptic world. In this companion novel she moves to a new location, a new society, (mostly) new characters, and a retelling of Baroness Orczy’s The Scarlet Pimpernel. Of course, she gender-switched the spy, so Persis Blake is the brilliant, secretive mastermind of the tale. Peterfreund portrays Persis as the consummate actress, playing out her dual roles with aplomb, but not without growing strain and conflict. Describing someone that lonely, brilliant and resourceful and making her relatable at the same time is no mean feat. It is a testament to Peterfreund’s ability that the tale seems fun, when it could easily be frenetic, given the main character’s activities and intelligence. That said, the faked (or not-so-faked?) romantic plot did not seem convincing until the final pages. Perhaps it was the continuual lack of trust between Justen and Persis? In any case, it was a weak point in an otherwise strong novel. On the other hand, the fraught relationship between Persis and Isla was very well done, and Justen and his sister Remy’s gradual disillusionment with their homeland’s revolution was skillfully woven into the narrative as well. As for setting, Peterfreund describes two islands (which their inhabitants assume are the only surviving habitable places on earth) that have been extensively terraformed, located somewhere in the middle of the Pacific Ocean. Albions and Galateans are of Polynesian (or similar) descent, and their highly stratified societies have developed in tandem. Genetic engineering and science rule the day, and the unintended consequences of advanced experimentation are threatening to rip one country apart. It is this very real danger that adds necessary tension and gravity to the plot, and while the science isn’t explained in great detail, it does hold together within the confines of the story. Overall, Across A Star-Swept Sea is a layered and delicious YA sci-fi. On one hand it is beautiful dresses and high society and faked love affairs. On the other it is deadly serious consequences and important questions about how societies are run and who deserves to hold power. The combination is heady fun. Recommended for: those who like pretty dresses, deceptively intelligent female leads, and spying (also: kissing! ), fans of The Scarlet Pimpernel, and anyone interested in science fiction for the young adult crowd.